Until recently, in our North American market, there was little choice as far as the type of Frankincense resin or essential oil one could buy. Religious, occult, and “new age” stores, aromatherapy and natural perfume shops offered only Frankincense Sacra or Carterii. (These 2 types are often synonymous with each other and whether they are the same or different species is still a popular topic for researchers and other experts in the field). As recent as the last decade or so there has there been an increase in the types of Frankincense one could easily acquire here. I assume this is in part to the increase in interest in aromatherapy and natural perfumes, the “Global Village” phenomenon and the integration and growth of African, Asian and Mediterranean communities in North America. 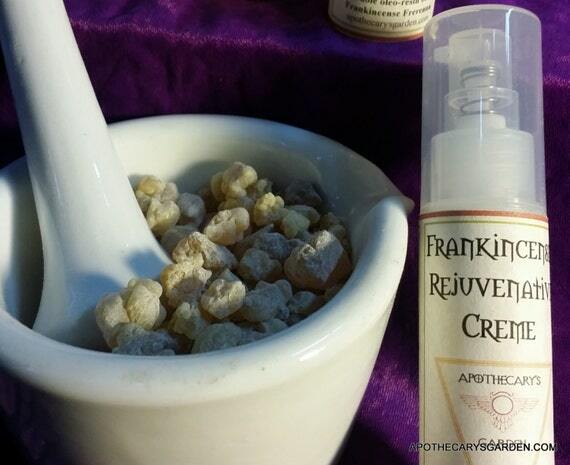 Frankincense (Photo credit: Wikipedia). Likely Boswellia Sacra/Carterii. Though the Boswellia family contains over 20 different species of Frankincense, there are only 6 or 7 types that are readily available commercially. Frankincense has been a valuable commodity and a very important part of our global cultures, religions and trade for thousands of years, highly valued for its medicinal ceremonial and esthetic uses, it is only recently that the different types of Frankincense have been examined closely and their unique chemical compositions studied. Until a short time ago there had been much confusion as to which chemical compounds were attributed to the individual species of Frankincense. Samples purchased from merchants for study were not directly taken from identified trees, and some research results were associated with the wrong species. This has been corrected and now one can look back on earlier valuable research and with an understanding of the proper chemical markers associated with each species, identify the correct oleo-resin on which the studies were based. ” Although the gum resin of B. Papyrifera coming from Ethiopia, Sudan and E. Africa is believed to be the main source of frankincense of antiquity (Tucker, 1986), there was until recently a great deal of confusion in the literature regarding the chemical analysis of its resin as well as of the essential oil derived from it by steam or hydro distillation. This was mainly due to the fact that analyses were done on commercial samples without establishing the proper botanical identity of the true source of the resin.”, on Boswellia Papyrifera, Aritiherbal.com. Some sound and exiting research studies conducted over the past few decades had reached the right conclusions, but for the wrong trees and oleo-resins, which compounded the confusion. Now that correct chemical markers are assigned to the different species of Frankincense, we find among other critical identifying markers, that Boswellia Papyrifera has the unique chemical markers Incensole and Incensole Acetate that distinguish it from the other types of Frankincense. Frankincense Boswellia Serrata is well known in India for its healing medicinal properties in Ayurvedic medicine. Boswellia Serrata resin extract shows great promise in the treatment of inflammatory diseases such as inflammatory bowel disease, rheumatoid arthritis, osteoarthritis and asthma. Among other characteristic chemicals it contains Boswellic acid which has been linked to anti-tumour and anti-cancer activity. I hope to elaborate on the chemical composition and medicinal applications of Boswellia Serrata in a future post. 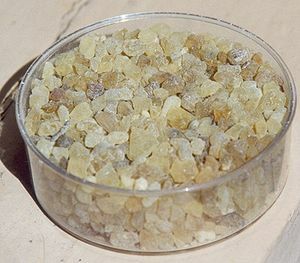 Boswellia Frereana is another unique type of Frankincense now more readily available commercially in North American markets. It grows mostly in Somalia, Yemen and Kenya and is widely used locally for ritual and medicine. In Somalia it is called “Meydi” and is burned daily in the home after meals and used to odorize ones clothing. It is sometimes called “Yemenite Chewing Gum”. Boswellia Frereana is composed mostly of resins and essential oils and contains very little water-soluble gum, this makes it especially suited to the purpose of chewing gum, because the resin and oils are not water soluble it does not dissolve or break down in the mouth, it softens when chewed, and can be masticated for long periods of time, cleaning teeth, massaging gums and freshening the breath with its essential oils. Its unusually low gum content, relative to other types of Frankincense can be seen in this chart of solubility courtesy of Ariti Herbal in Addis Ababa. Another way this high ratio of oleo-resins to gums can be verified is noting the way Frankincense Frereana melts and is absorbed into a hot incense charcoal, leaving nearly no carbon residue and emitting very little of the traditional burnt odor other types of Frankincense do. This charred remnant is a result of the water soluble gums burning and some historic references cite this charred portion of Frankincense as an ingredient in traditional middle eastern Kohl, eye liner, along with Antimony and other ingredients. Containing almost no water-soluble gum, Frankincense Frereana does not dissolve when masticated, for this reason is used as an all natural chewing gum. It is composed mainly of resin and essential oils. Ethiopia is home to three commercially important types of Frankincense, none of which had been easily available in North America till recently. Boswellia Papyrifera, or Tigray type from the north, Boswellia Rivae also called the Ogaden type from the south east Ogaden area and Boswellia Neglecta from the Borena area of Ethiopia. All are used locally and are commercially important resources. Their wood is used for fuel, construction and furniture, the bark for incense and medicine and the oleo-resins are used among other things, to produce bases for varnishes and adhesives, essential oils, absolutes for perfume, and as incense and medicine. 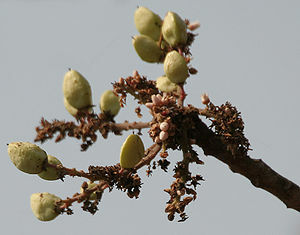 Boswellia Papyrifera is by far the most extensively used oleo-resin locally and abroad. It is used in Ethiopian households daily as incense and in their traditional coffee ceremonies, it is the choice incense of the Ethiopian Orthodox Church and is also used locally as an insect repellent and for medicine. It has been the Frankincense of choice by Churches and religious institutions all over the world for hundreds if not thousands of years. Both Boswellia Rivae and Boswellia Neglecta deserve their own segment here, so I will leave their detailed descriptions for another day and focus on Boswellia Papyrifera . Boswellia Papyrifera is distinguished from other types of Frankincense by the presence of large amounts of Octyl Acetate and Octanol and two other unusual and unique chemical markers, Incensole and Incensole Acetate. Studies have shown that Incensole Acetate affects our central nervous system and posesses psychoactive properties. According to studies, Incensole Acetate can generate heightened feelings of well being and spirituality, reduce feelings of anxiety and depression and improve memory function. Other research has indicated that Incensole Acetate shows neuroprotective and anti-inflammatory properties and indicates it may be of use in cases of stroke and head trauma. It is presumed that Incensole and Incensole Acetate are absorbed by the body through the smoke released during the burning of Frankincense as an incense. One can see how this might be an ideal incense for spiritual/religious purposes in churches and temples. The discovery of Incensole and Incensole Acetate as identifying chemical markers of Boswellia Papyrifera goes a long way to bolster the theory that Frankincense Papyrifera is indeed the true Olibanum and “Frank”(True) Incense of ancient times and scripture. Employing an incense that has psychoactive properties and elicits altered states of mind during ritual and ceremony, would make this incense a very valuable commodity to churches and other religious establishments, and would require a special knowledge to discern between regular non psychoactive incense and the true, or Frank-incense. This would be a valuable skill when one purchased such an exotic and expensive imported item for church use. Oleo resins such as Frankincense and Myrrh were at times worth their weight in gold, they were hard to come by, growing only in Ethiopia they would travel by caravan, ship, boat, donkey, horse or camel, or all the above often for many months. They would exchange hands many times before they reached their final destination which could often be thousands of miles away. One can safely assume, because of their value and scarcity in most parts of the world, they would run a real risk of being adulterated or replaced along the way with other less expensive materials for the profit of those that traded in such items. This would lend even more weight to the need to be able to identify the “true” incense from other types. The Frank-incense. Boswellia Rivae, has a distinct haunting, rich and deep fragrance. The resin stands out in its aroma, fresh, as well as when burned as incense. The essential oil is a sweet, compelling, mysterious and complex mix that brings to mind mystery, magic and ancient sacred places. It has a surprising sweet note reminiscent of Palo Santo, unexpected in a Frankincense essential oil. 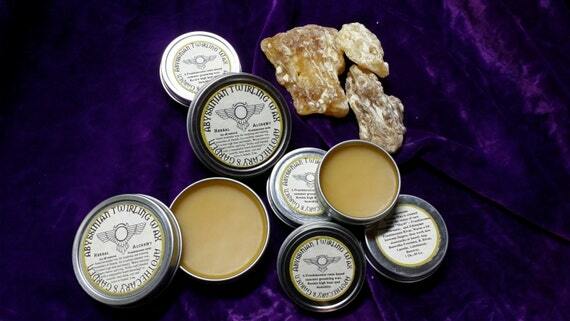 Boswellia Neglecta; Is another unusual Frankincense from Ethiopia. It is a delight burned as an incense, grounding and elevating. It has a pine like component which nicely rounds out an incense or Bakhoor mix. The essential oil of Frankincense Neglecta is also grounding, earthy & sweet. More stimulating than relaxing. The essential oil and oleo-resin have a boldness that makes them quite a different experience than the Boswellia Sacra/Carterii we have gotten used too.